The spiny grey stem will soon form a fan-shaped or snaky ridged bush reminding of a boa asleep. 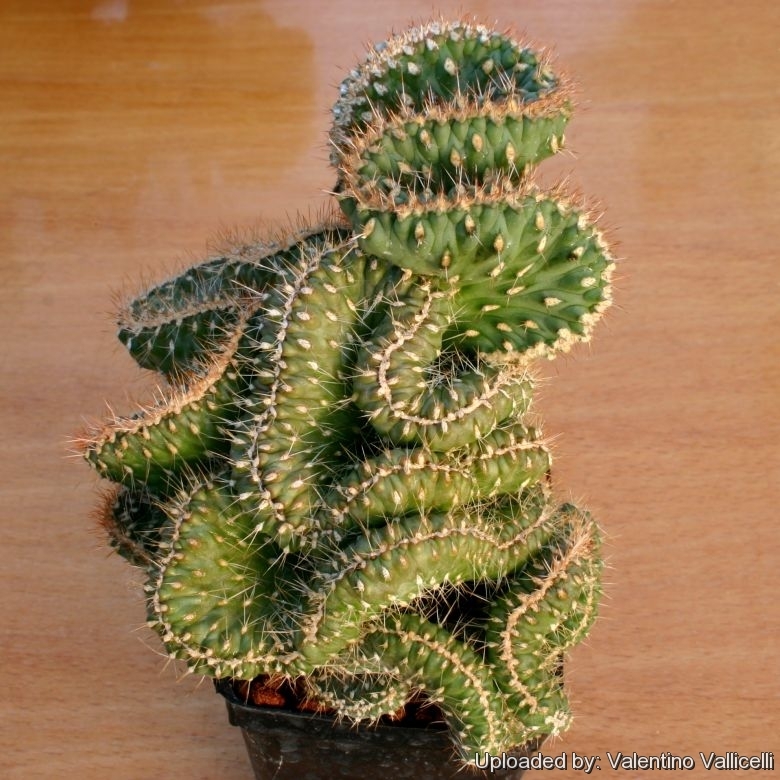 Even if his form is rare, this cactus is however resistant and easy to grow in an acid draining soil, needs full sun. Origin and Habitat: Locality not stated. Cylindropuntia fulgida var. mamillata (A.Schott ex Engelm.) Backeb. Opuntia fulgida var. mamillata (A.Schott ex Engelm.) J.M.Coult. Opuntia mamillata A.Schott ex Engelm. 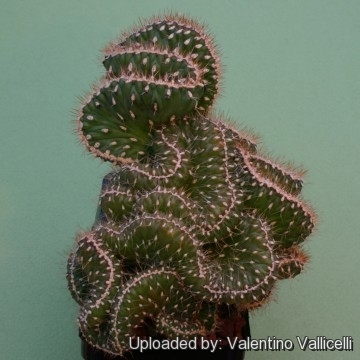 Description: This crested cultivar is astonishing. It is derived from a large Mexican cactus but the cultivar is compact, small, and presents a silhouette made of heavily convoluted folds. The short living grey/green foliage is arranged only at the top of the stem. The spiny grey stem will soon form a fan-shaped or snaky ridged bush reminding of a boa asleep. 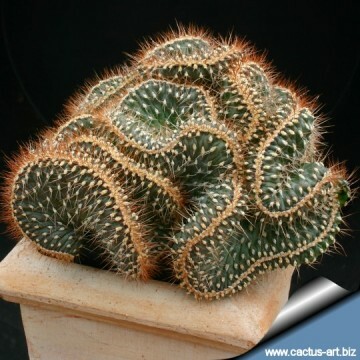 Even if his form is rare, this cactus is however resistant and easy to grow in an acid draining soil, needs full sun. Cylindropuntia fulgida (Engelm.) F.M.Knuth: (var. fulgida) Spines of stems interlaced with spines of adjacent areoles, the longest usually 2.5-3 cm; sheaths baggy; stem segments appearing spiny from afar, obscuring strongly mammillate tubercles beneath. Cylindropuntia fulgida f. cristata P.V.Heath: Compact, small, crested form that produces a silhouette made of heavily convoluted folds. The short living grey/green foliage is arranged only at the top of the stem. The spiny grey stem will soon form a fan-shaped or snaky ridged bush reminding of a boa asleep. Cylindropuntia fulgida var. mamillata (A.Schott ex Engelm.) Backeb. : Spines of stems not or little interlaced with spines of adjacent areoles, the longest usually 1-2 cm; stem segments appearing spineless or nearly so from afar, exposing strongly mammillate tubercles beneath. Cultivation and Propagation: Crested growth: Unlike 'monstrose' varieties of plants, where the variation from normal growth is due to genetic mutation, crested growth can occur on normal plants. Sometimes it's due to variances in light intensity, or damage, but generally the causes are unknown. A crested plant may have some areas growing normally, and a cresting plant that looks like a brain, may revert to normal growth for no apparent reason. If you have any of the crested part left you need to remove the normal growth and leave the crested part behind this will need to be done regularly.